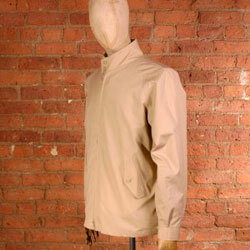 Yet another twist on the harrington jacket, with Baracuta launching the G4. It seems to be slightly longer than the usual harrington, with a tailored hem replacing the usual elasticated waist, as well as a button cuff and belted waist adjusters. Other details include the Baracuta check liner, two-way zip, button fastening collar and button-fastening, flapped, hand pockets. Expect to pay around £120.